Acme RX316TF DP LGA2011 E5-2600 server, 3U rackmount, Black Color. 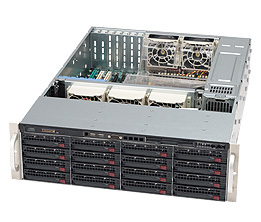 this system is designed for high performance storage server, good for database or VM applications. Supports up to 512GB of Registered DDR3 1333/1600MHz memory. 3 PCI-e 3.0 X16 slot. 3 PCI-e 3.0 X8 slots. 2 SATA3(6Gb) and 8 SATA2 ports Serial ATA (SATA). one floppy port, no IDE. Integrated IPMI 2.0 with Dedicated LAN, IPMI 2.0 with virtual media over LAN and KVM-over-LAN support. 3U case with 800W High Efficiency power supply (option to add one 800W module for redundant function). 16 of 3.5" HDD bays (w/ backplane SAS/SATA, hot-swap). Width: 17.8 in. Height: 5.2 in. Depth: 25.6 in. ** Suggest to add a SAS RAID (16-port or 2 of 8-port) controller to handle all hard drives, the system will be high performance storage server. ** can use external USB DVD drives. *** can add a SAS or SATA RAID controller (recommended).